Advanced microfiber technology removes contamination at a microscopic level. The Dragontail cleaning element is constructed of multiple lint-free Draco™ microfiber strands that are able to capture particles at a 4 micron level. Unlike bristles or silicone discs, which glide over adhered contamination, the microfiber cleaning element detaches, captures and removes gross contamination. 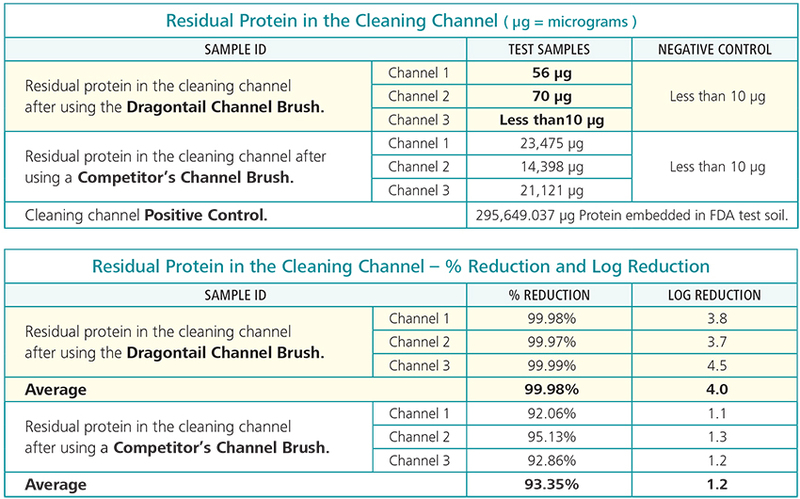 In a comparative study, under identical conditions, the Dragontail Channel Brush cleaned 468 times more contamination than a traditional style channel brush. Photo B – Channels after cleaning with a Competitor's Channel Brush. Photo C – Channels after cleaning with the Dragontail Channel Brush. The artificial test soil used to inoculate the cleaning channels mimicked the worst case contaminants (blood and proteins) that may come in contact with a medical device, and remain on the device after clinical use. Three inoculated channels were cleaned with the Dragontail Brush and three inoculated channels were cleaned with a Competitor’s Brush. The procedure – one channel brush and one inoculated channel were submerged in sterile water. The brush was pulled through one time, under sterile water without the use of detergents or rinsing. This test was repeated using a different inoculated channel with a fresh channel brush each time.